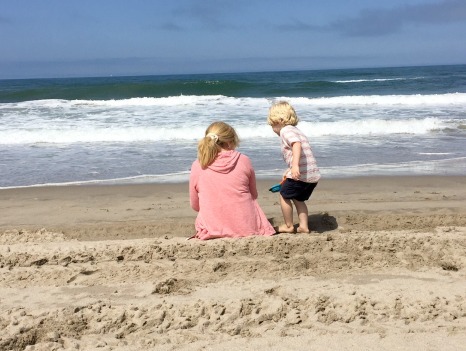 One of the things we like to do with our grandchildren is spend time at the beach combing for sea glass. Even our three year old grandson has an eye for finding the shiny tumbled glass gems. White and brown sea glass is plentiful. Blue and green are more scarce, so we get excited when we find those!! Currently we keep our sea glass in a designated “sea glass” jar. One of these days, when we have more than the jar will hold, we will create something beautiful. Until then we are content to keep the sea glass in the jar, pouring it out now and then to look over our collection. The best place to find sea glass is in the areas of dense gravel or rocks during low tide or after a storm. Some days we’re lucky, some not. 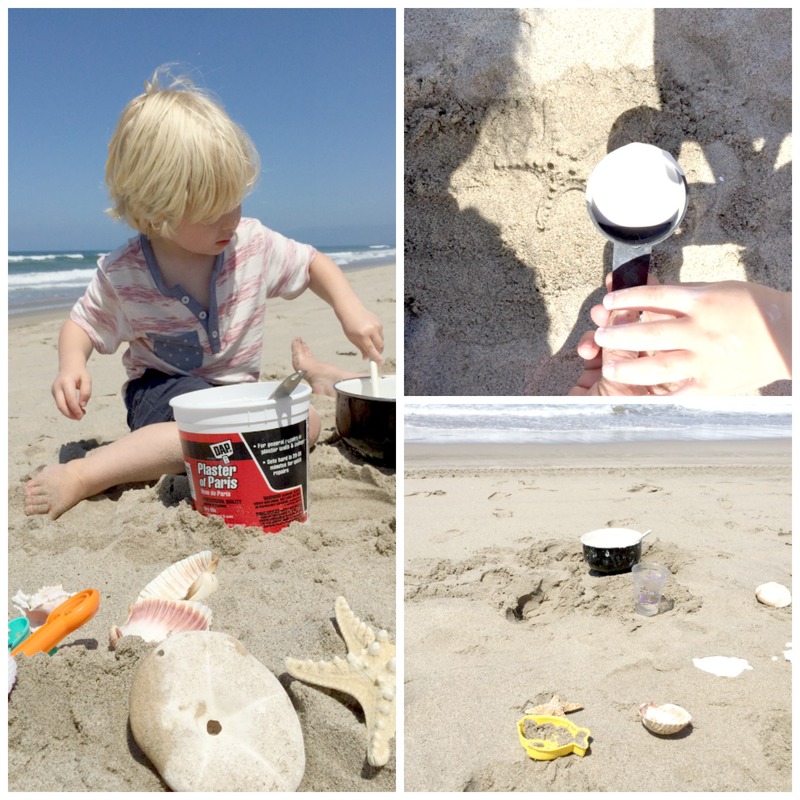 On our most recent trip we took supplies for a beach craft just in case the sea glass hunt didn’t go so well . 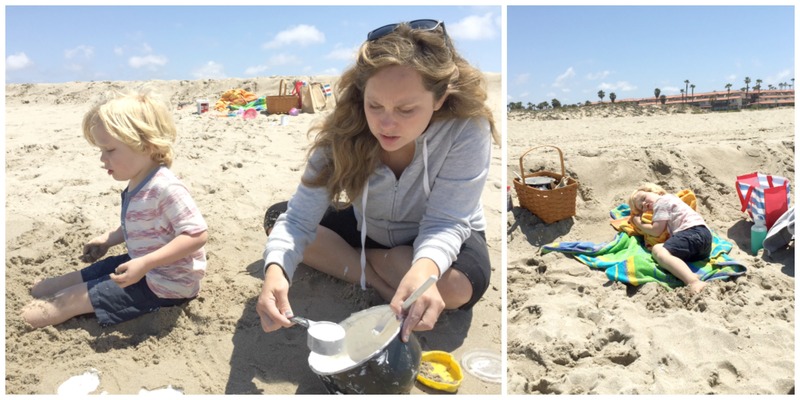 With basket, beach towels, and bags in tote, we set out for a morning of fun in the sand. It was cool and overcast at the beach but as the day progressed it warmed up quite nicely. 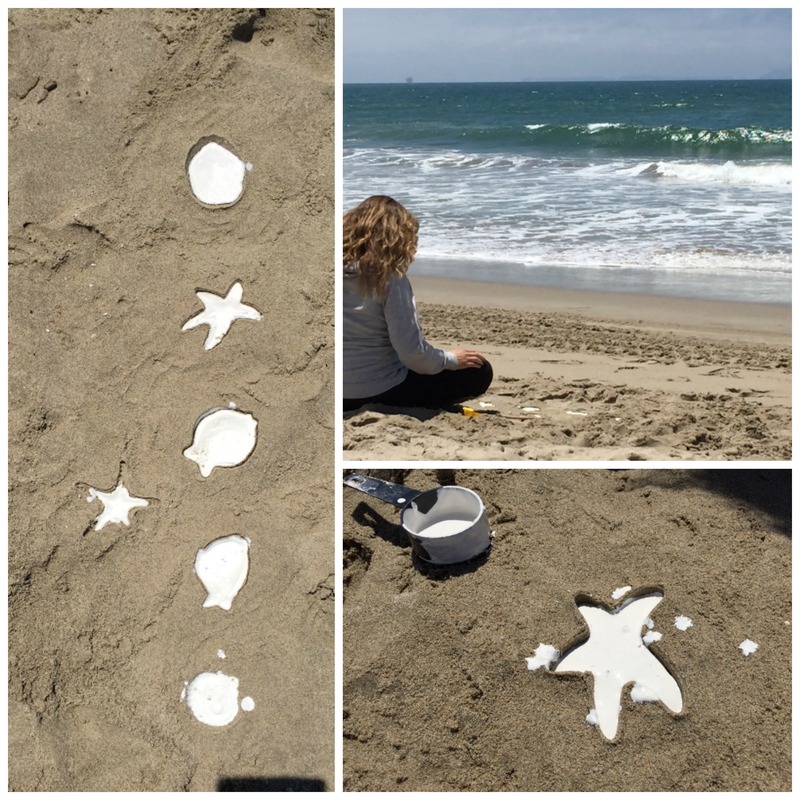 No sea glass today, but lots of sand, so we made our first attempt at creating sand casts. I forgot the fresh water for mixing the plaster of paris so we had to make a run to the nearby public restroom for a quick supply. By that time, Noah (3) and Mom (25 weeks pregnant) both needed a potty break anyway. Our first sand casts came out perfect. The second group, not so well. We had run out of fresh water and rather than make another trip to the restrooms we decided to try salt water. Doesn’t work! After waiting and watching over our casts for over an hour, they still didn’t set up. So, take note… no salt water! In the end, a three year old is generally content with playing in the sand and picking up drift wood. After about an hour we were beginning to lose Noah’s attention, as you can see. But Mom and Grandma were having lots of fun. All in all we had a really nice morning just hanging out together, taking in the moist sea air and watching the waves. Noah even took a short siesta. He was worn out when we got home. After having lunch, he said “I’m ready to go upstairs now (to take a nap)” which he almost never says! We now know the way to wear him out…trips to the beach…every day!! 1. Find a place where the sand is wet but far enough from the water so the waves won’t wash away your creations before they dry. Or, if you want to play it safe, choose a place in the dry sand and wet a small area using ocean water. Save your fresh water supply for mixing the plaster! 2. Push the sand toy, starfish or sea shell into the sand making sure sand around the shape is firmly packed. 3. Mix the plaster of paris, 1 part plaster and 2-3 parts water. Mix until it reaches a consistency where it pours freely. If the plaster is too thick it won’t flow into the smaller areas easily. 4. Remove the toy or shell from the sand and slowly pour or ladle the plaster of paris mixture into the shape. 5. If you want a hole for hanging your finished sand cast, insert a straw into the sand protruding up past the edge of the shape before filling with plaster of paris. 6. Depending on weather conditions, the plaster usually takes about 20-30 minutes to harden enough to safely remove from the sand. Once the sand cast is removed, gently brush excess sand from the shape or rinse with water. It will continue to harden after removed from the sand.